Celia is passionate about music. She began violin lessons at age seven after a successful lobby to both her school's principal and her parents. Five years later, she's added piano lessons, dabbles in guitar, is giving serious consideration to a conservatory-style program for high school. This child lives and breathes music! 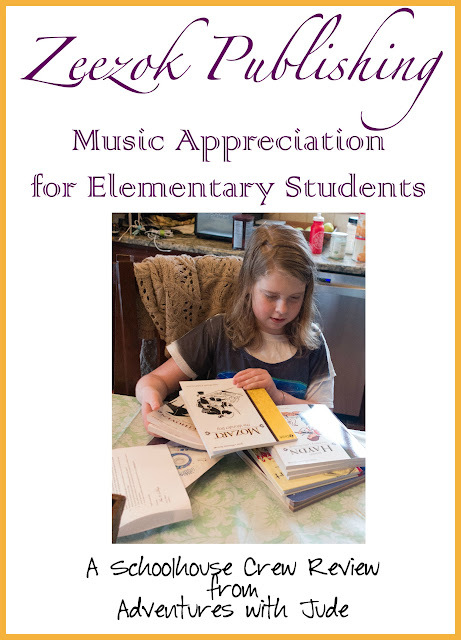 I had a feeling that she was going to love Zeezok Publishing LLC's Music Appreciation Book 1: for Elementary Ages. It's nice to know that sometimes, even with a "tween," Mama was right. It was like Christmas when the box arrived! 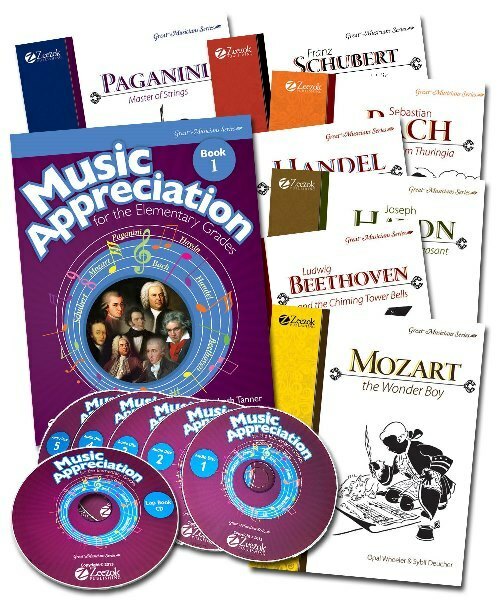 The Music Appreciation Book 1 Collection consists of a student Activity Book, music CDs, a printable lapbook, and composer biography texts. Seven Baroque and Classical era composers are included in this music curriculum: Bach, Handel, Hayden, Mozart, Beethoven, Paganini, and Schubert. Units are divided by composer, with four weeks allotted to each. Zeezok has composed this program to meet national Music Appreciation standards for kindergarten through sixth grade. Each composer is a self-contained unit, so you can begin anywhere in the program, not just at the start. However, Celia eagerly started at the beginning with Bach. The Student Activity Book is the "tour guide" of the program. It begins by breaking the lessons down into a manageable syllabus. 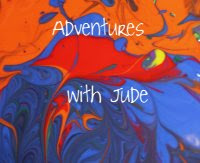 Activities for each week are outlined, with about seven to ten activities for each week. Activities that are "required" to meet the national standards are marked, making it easy to scale the program from a "highlights to fulfill a state requirement" to an "in-depth unit study." A sixth grader and fairly strong reader, Celia found that she could complete a "week" in just about two hours. 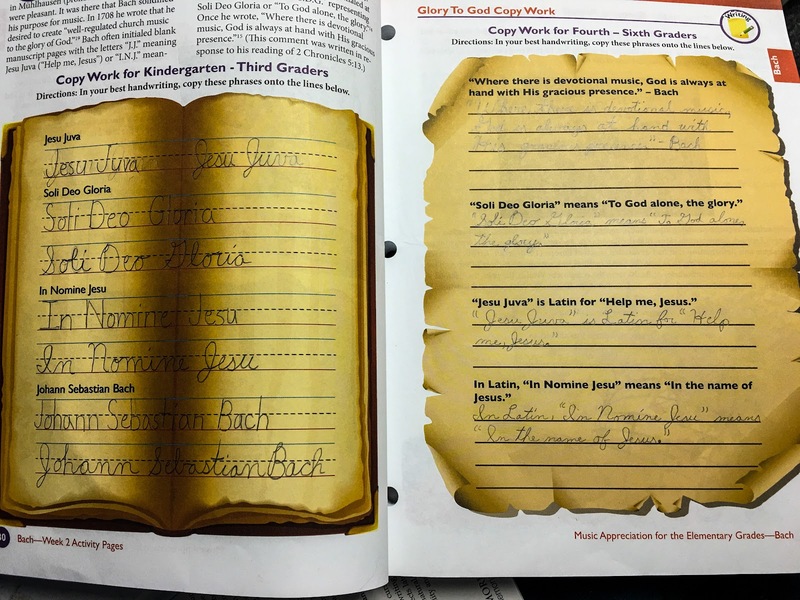 The first lesson each week is to read the accompanying composer biography, and then complete the activities in the workbook. It contains comprehension questions and supplemental activities, ranging from music-focused instrument identification and music theory to cross-curricular activities. When appropriate, the activities are leveled for different age ranges: manuscript vs. cursive copy work, drawing a picture vs. writing a paragraph, etc. Note: it ALSO contains the answer keys at the end of each unit. I have mixed feelings about having it in the middle of the student book. Being a music student, Celia is familiar with several of Bach's compositions. I loved that the biographies included playable passages of selected pieces. After discussing one of Bach's minuets, the text asked, "Can you play this?" and showed the notation for the piece. After quickly scanning it, Celia laughed out loud and said, "Actually...Yes!" A more in-depth comparison and she realized it was her recital piece from last spring! However, if your student is not a musician, it won't stop her from learning. The musical compositions presented in the biographies are recorded onto the included ten CD set. Music is such a multi-sensory experience. I think it's very smart to have the sheet music to follow along with listening. 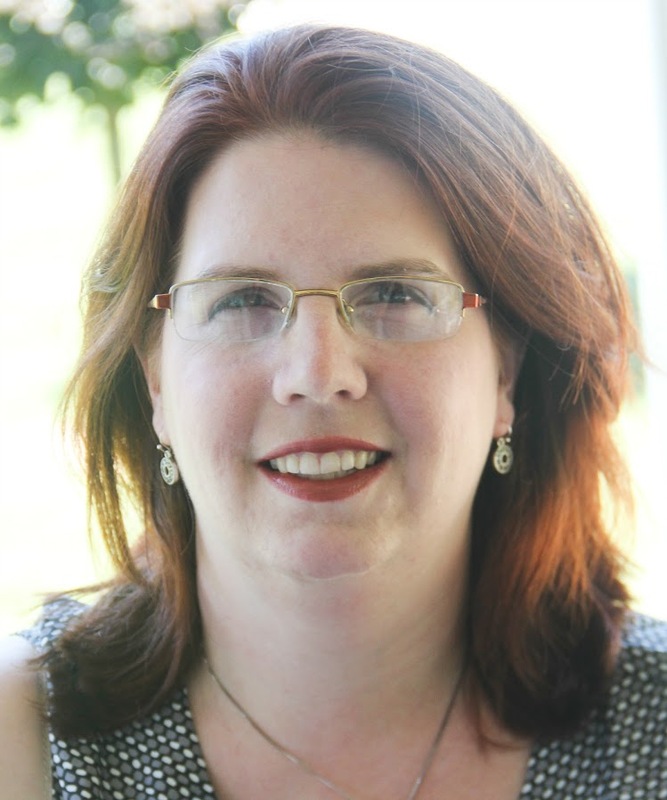 Zeezok wants the program to be a multi-sensory experience, and this helps. Sure, hearing a piece is one sense, and reading the biographies uses sight, but I believe that to be fully appreciated, music needs to be experienced using multiple senses simultaneously. (I think that this is a reason that symphony concerts are often considered "boring" -- just listening doesn't provide enough sensory input for many people.) 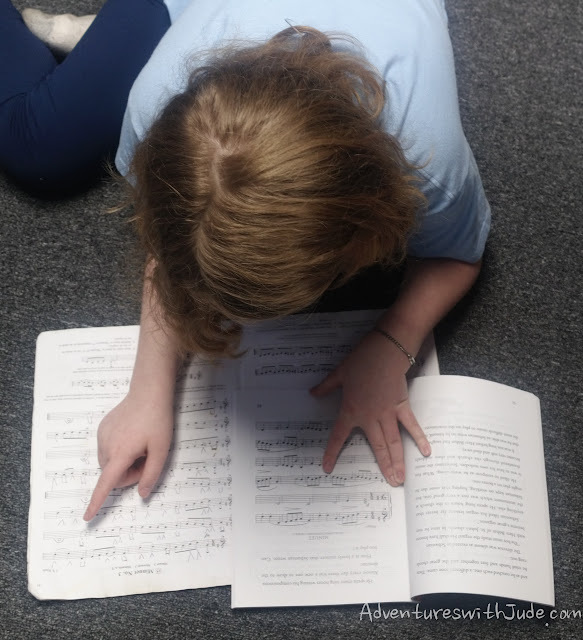 Even if a student can't read individual notes, following along with the written composition can see when the music goes up in pitch or changes fervor, and the visual and tactile experience enhances the auditory portion. Finally, there is an accompanying lapbook that coordinates with the textbook activities. 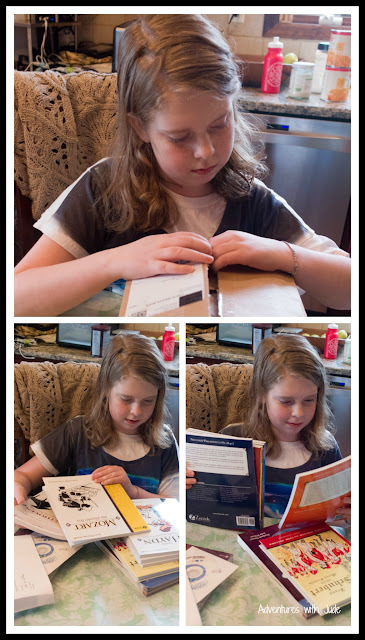 Celia enjoys the creativity of most lapbooks, but she was not as excited about this one as I thought she would be. 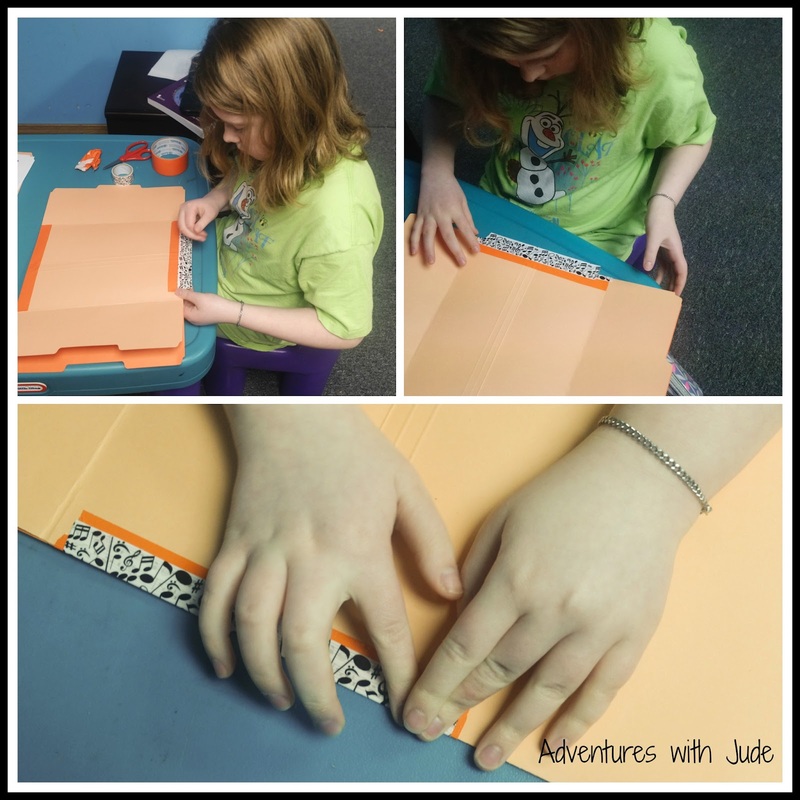 She enjoyed assembling the folders, and even broke out her "good" music note duct tape! 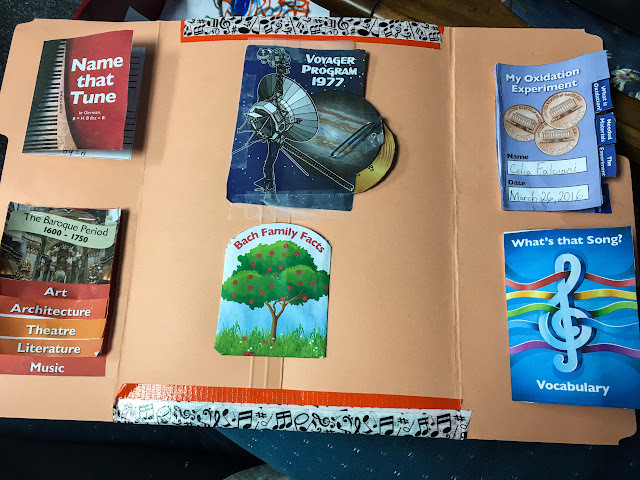 For the first activity, she got to work "compose music" on a staff, but then was disappointed that the rest of the activities, as she put it, seemed very "Glue tab A into slot B." The color PDF-sourced printouts were beautiful, but she would have preferred the ability to decorate/color the covers. She also thinks it would have been nice to have a way for her to write definitions, rather than just gluing pre-printed ones to booklets and then gluing the booklet to the folder. She thought that pre-printed made sense for younger kids, but this sixth grader seemed almost insulted that she wasn't getting the opportunity to do them herself. She thought there were great things to learn from the content, but the assembly part was boring for her. Celia couldn't wait to share what she learned with her music teachers! She is excited to be working on the unit about Handel because one of her current repertoire pieces is from his oratorio, "Judas Maccabeus." She feels like she has learned a lot about Bach, which has helped her interpret the minuets and musette that she has been performing. She hopes learning about Handel will help her with this piece as well. To learn more about Zeezok's Music Appreciation courses, follow them on social media, or click the banner below.